Reading Thermal has introduced the Pan+Dough Probe, a fixed position, dough interface/core temperature measuring device that provides accurate, repeatable data that are not possible with hand-placed thermocouple probes. 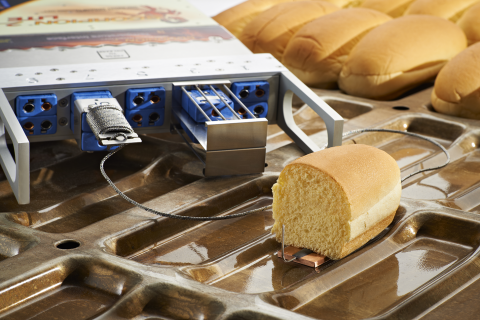 The Pan+Dough Probe is placed under the bread or bun dough and simultaneously captures the pan/dough interface temperature and the dough core temperature. The Pan+Dough Probe connects to a Temperature Interface device that can accommodate five Pan+Dough Probes. The probe’s copper spade is pressed against the pan by the weight of the dough, and measures the critical pan/dough interface temperature. The vertical, stainless steel, dough core temperature probe penetrates the dough at a fixed distance from the pan. These readings are used to produce the Bake Cycle S Curve indicating critical temperature points for yeast kill, gelatinization and arrival time as they relate to the percentage of travel through the baking chamber. SCORPION® Software Version 8 (SV8) automatically calculates the three S Curve data points. Environment temperature is also measurable using sensors connected to the Temperature Interface device. Reading Thermal introduced the SCORPION® 2 LITE Temperature Profiling Package to provide customers with a convenient, low cost solution for measuring and monitoring temperature levels in commercial ovens, cooling tunnels, freezers and dryers. Developed primarily for producers in the baked snack food industry, the system has demonstrated potential for application in a wide range of manufacturing environments that utilize a continuous conveyor process, such as meat processing, nut processing, electronics, aluminum can production, and more, said Richard Starke, Director, Reading Thermal. The SCORPION® 2 LITE Temperature Profiling Package consists of a SCORPION® 2 LITE Data Logger and a Temperature Interface that provides the ability to measure 10 Temperatures at user defined positions in a thermal process. This helps ensure consistency and high quality while minimizing the amount of substandard product or waste. Particularly in commercial baking, having the ability to monitor temperatures from the beginning through the end of a continuous conveyor food processing system is crucial to ensuring the overall quality of a production line, said Starke. For example, baking bread in a continuous conveyor process requires the product to reach certain temperatures at specific times in the bake cycle. If those correlations aren’t reached and monitored to ensure repeatability, product quality will suffer. At $8,000 the SCORPION® 2 LITE Temperature Profiling Package offers an affordable, cost-effective solution to meeting the challenge of temperature monitoring, said Starke. In addition, customers who opt for this package will have the ability to upgrade to more advanced measurement capabilities such as airflow, energy transfer and humidity – while maintaining full compatibility with all existing SCORPION® equipment.